1. Waterslides – My parent’s used to take us to the watersides all the time when we were young and we used to have a blast! And now I want to take my kids and introduce them to all the fun that watersides have to offer. 2. Backyard Tent – Last year I saw this wonderful and simple idea from Mama Papa Bubba of making a backyard tent for the kids to enjoy and I hope to try it out this year. Imagine how much fun that would be! 3. 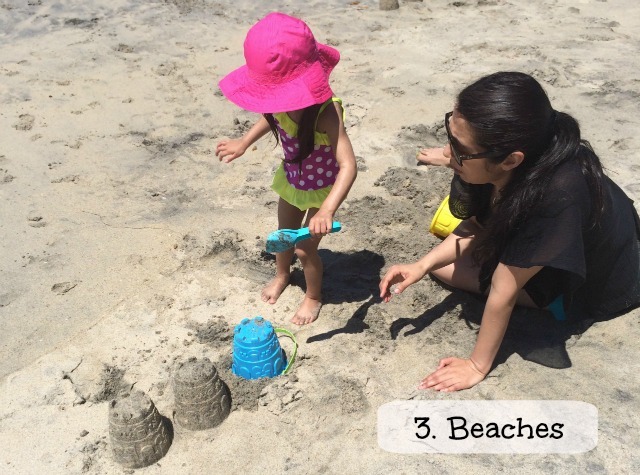 Beaches – There are so many great local beaches and this summer we want to visit as many as possible and take advantage of the beautiful weather and locations we have in this wonderful city. 4. 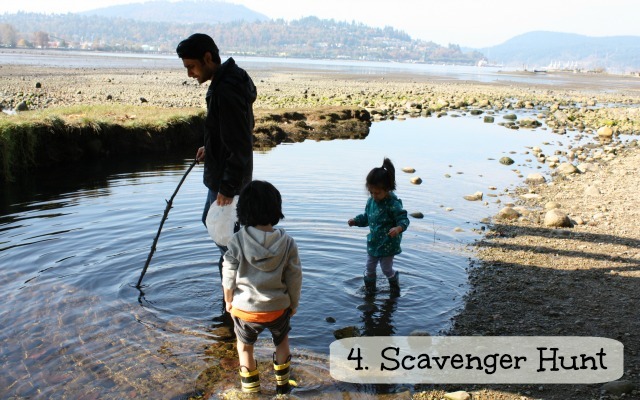 Scavenger Hunt – Last year I put together a Nature Scavenger Hunt for the kids and they had so much fun, that this year I want to do it again, but I want to make it just a little harder. 5. Capilano Suspension Bridge – Sometimes you just have to be a tourist in your own town and we are going to be just that and visit the suspension bridge. I haven’t been in countless years but I do have great memories. I think it would be a great adventure for the kids. 6. Biking the Seawall – We also want to rent bikes and ride around the Stanley Park Seawall. Can you believe in all my years of living in Vancouver, I have never done that?! No time like the present to remedy that. 7. 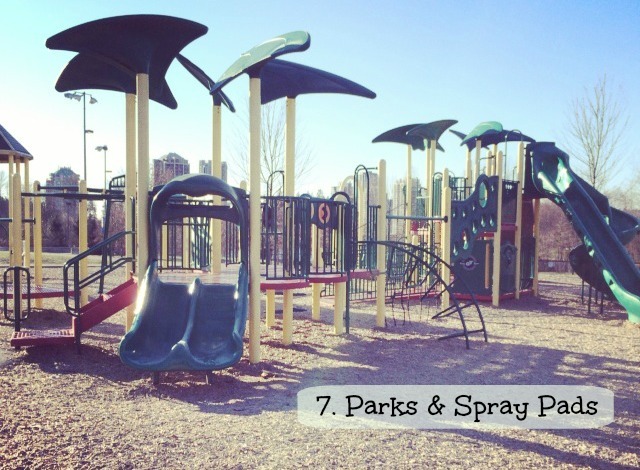 Parks & Spray pads – Each week we are going to visit a new park or spray pad. It’s a great way to explore new places and have new adventures. 8. Take Public Transportation – We’ve always walked where we want to go or we’ve taken the car. This summer I want to take the kids on the bus, skytrain and sea bus, just for fun. 10. Mini-Vacation – And last but not least, I want to start a family tradition where every summer we take a short 3-4 day family vacation somewhere we can drive to and have a quick family getaway. 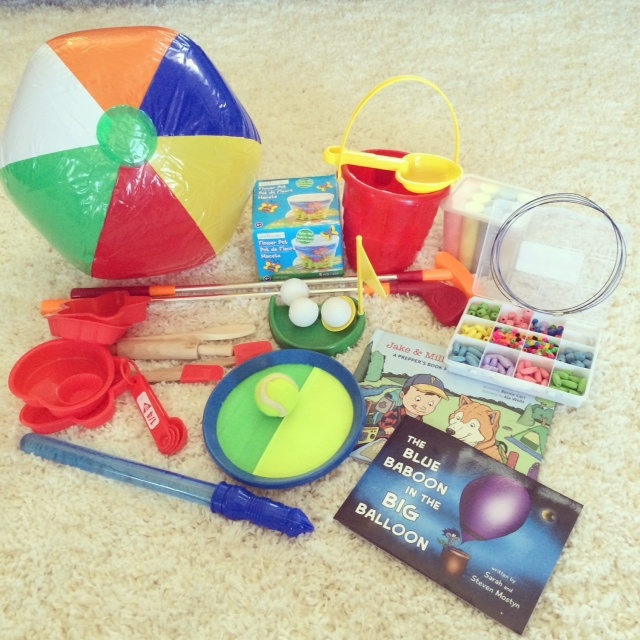 To kick off the start of summer, I’m also giving away some fun things for the whole family. First off, I went out and got a bunch of things that’ll help make summer fun for your kids on inside and outside days. 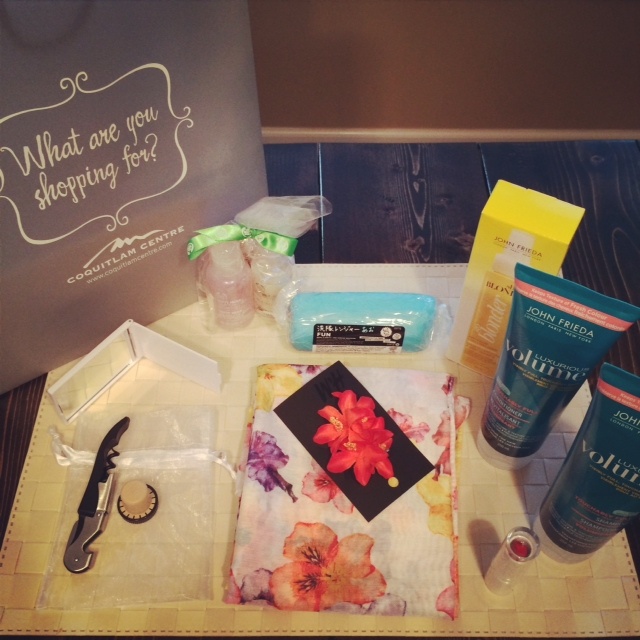 I’ve also been saving up some swag that I got, most recently from an event that I attended at Coquitlam Centre and a shopping party I went to at Joe Fresh and I’m giving it to you! And a little something for that iPhone owner in your life. I don’t want to leave out Dad, so here’s a really cool device that’ll make you hands-free with your Iphone in the car. 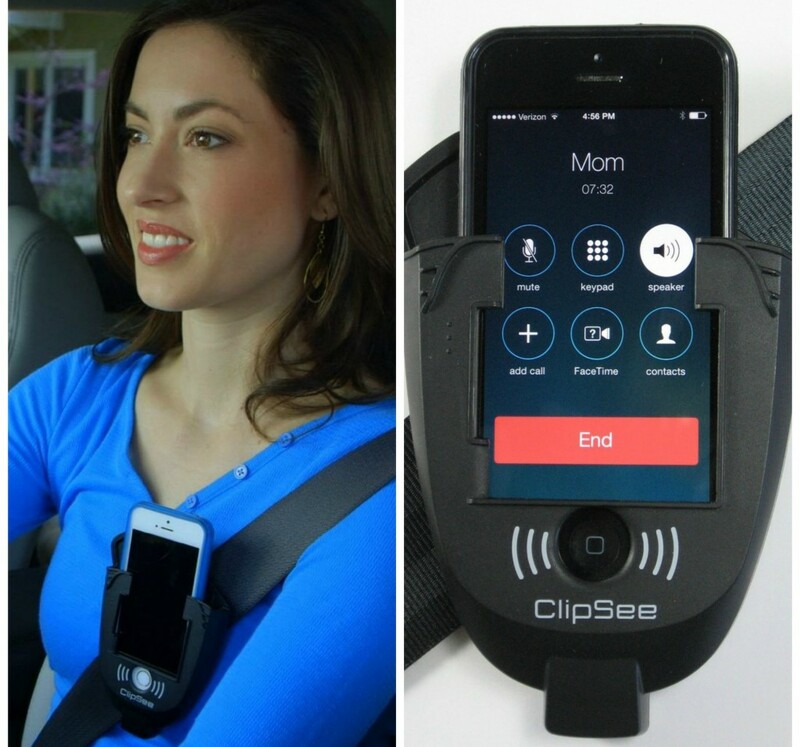 It’s called a ClipSee and it’s the perfect solution when you need to talk while driving. It clips right on to your seatbelt, it amplifies speaker sound by approximately 3X and the home button access and finger guides lets you make and receive hands-free calls while staying focused on the road and your driving. This is actually perfect not only for Dad, but anyone who has an iPhone. To enter, all you have to do is follow the instructions on the Rafflecopter below. This contest is only open to residents of Greater Vancouver. Lots of great stuff on your bucket list. I can’t believe you haven’t ridden the sea wall? You will love it and you can mark down a water park visit too! Sounds like summer filled with fun and adventure! Post photos! Beach is always on my summer list. Great read! I love you bucket list. You have some great ideas on there! Such a great idea and so many neat places to see around vancouver !!! Awesome bucketlist! Spray parks are also on our list. This year I want to take the kids to the Vancouver Aquarium. taking my daughter for her first kayak adventure in Deep Cove is on my bucket list. I’d love to take a day trip to Bowen Island or Gibsons Landing! Definately spray parks on our list! Your bucket list is almost the same as mine and mine is for the same reason (and sentiments). 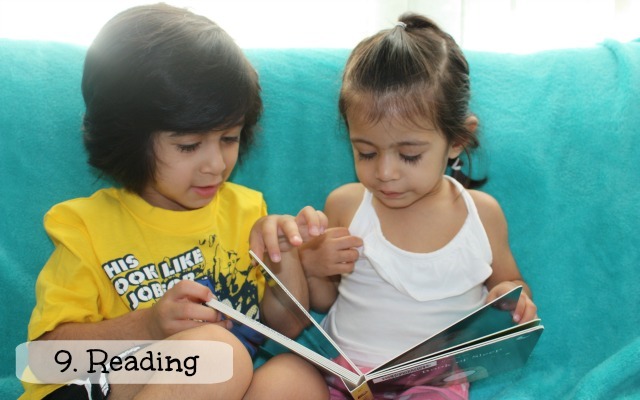 My two are starting kindergarten in the fall. Let’s join forces and support each other in September. We can do it! Thanks for sharing, ours is mostly the same as our little man starts k in the fall. Camping, fishing, nature walks, beaches, parks, swimming should be a great summer! We are going to Playland this summer! DD can’t wait, and is learning about saving money for a goal. Lots of great things on your summer 2014 bucket list. The clip see is a fantastic gadget. I am ordering one now. This is the perfect solution for those who don’t have bluetooth available in their car. Wow, your bucket list is pretty ambitious. Sounds like your going to have a very busy and fun summer! Thxs for the great idea….i think i might make a bucket list for myself. Oh, water slides. I’ll add that one to my summer bucket list! Going camping at a lake. What an awesome list. Thanks for sharing. Will have to try some of these things out. We always go to the drive in at the end of summer (when the sun sets earlier), we try to go to the Armstrong Fair and lots of beach time at the lake. Oh and picking cherries pretty quick!